This gradual tanning moisturiser is perfect for face and body. The synthetic-free blend of aloe vera, avocado oil and cacao fruit powder builds upon your natural complexion while nourishing your skin. 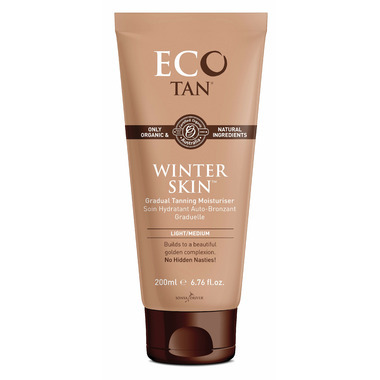 Once applied, Winter Skin can be used over consecutive days to build tan to your desired colour. Love this gradual tanning cream! The first application the colour is awesome and lasts up to 5 days. If I want a bit more color I just do another application. Iâ€™m quite fair skinned so itâ€™s not orange and doesnâ€™t smell bad at all.